Danish filmmaker Susanne Bier (Brother; After The Wedding; The Things We Lost in The Fire; Love Is All You Need) is commonly associated with heavy dramas and light romantic comedies. 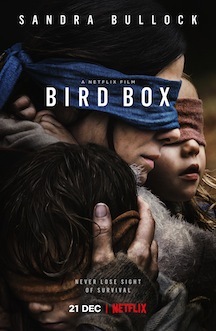 Her first American blockbuster, Bird Box, is a supernatural drama thriller starring Sandra Bullock as a single mother of two children who desperately looks for a safe place to raise them while the planet is under an unfathomable alien threat. Assuming ghostly forms, the invaders urge their victims to commit suicide right after they make visual contact with them. Therefore, the solution is to become blindfolded while outside and never listen to their persuasive words, which are deceptively uttered through the voice of a loved one who passed away. Expecting a child, Malorie Hayes (Bullock) sees her all-too-lively sister, Jessica (Sarah Paulson), succumb at the sight of the enemy and takes refuge in the house of Douglas (John Malkovich), a sinister and pragmatic man who didn’t seem much affected after witnessing the death of his wife in shocking circumstances. In the house, they not only welcome the innocuous Olympia (Danielle Macdonald), another pregnant woman, but also Gary (Tom Hollander), whose behavior and intentions are far more suspicious. After the kids are born, an attentive man, Tom (Trevante Rhodes), gains her trust and becomes her lover. But anyway, Malorie will have to make a perilous two-day journey alone with the kids, helplessly named Girl (Vivien Lyra Blair) and Boy (Julian Edwards). Blindfolded, they have dense countrified areas and a stirring river to be crossed. Is this practicable? Eric Heisserer (Arrival; Lights Out) penned the script according to Josh Malerman’s novel of the same name, having Bier directing exclusively in the US for the first time. Aiming to the senses without never really impress or startle, Bird Box adopts easy strategies, creating frivolous scenes and employing contrived tones as a result of the narrative fatuousness and cheap abstraction. Ms. Bier, whose previous directorial efforts kept toggling between competent and sloppy, fully embraces Hollywood this time with dubious quality, and that comes with a price. Following impossible, far-fetched routes, Bird Box is a lumbering and quite incongruous mess.